Homer, the greatest name in the history of epic poetry, and who stands as high in that department as William Shakespeare does in the drama, has come down to us in modern times unfortunately as little better than a name, and presents materials for biography as scanty as those which he offers for criticism are rich. We are not, however, forced to go to such lengths of doubt in his case as Aristotle did in the case of Orpheus, denying that such a man ever existed; for though there was a time (particularly in Germany) of skepticism as to that possibility, there is now almost unanimous verdict in favor of the historical reality of the author of the Iliad and the Odyssey. Not that any reliance is to be placed on the details of the old Greek lives of Homer, which are manifestly fictitious; but the internal evidence of the epics themselves leads to the belief in an authorship such as agrees substantially with the kernel from which these very ancient legendary traditions were developed. The central fact in which all these traditions agree is, that the author of these poems was an Asiatic Greek; and though other places are named, the greatest amount of legendary evidence clearly points to Smyrna as the city of Homer's birth. The dialect in which the Iliad and Odyssey are written -- the Ionic -- is the very variety of Greek which was afterwards used in the same region by Herodotus, the father of history, and Hippocrates, the first and greatest of Greek physicians; and the allusions to natural phenomena, especially the frequent mention of the strong northwest wind blowing from Thrace, plainly indicate the west coast of Asia Minor as the familiar residence of the poet. The chronology of the Homeric poems, both as respects the great central event which they celebrate -- the Trojan War -- and the age of the poet himself, is much more doubtful; but it is quite certain that Homer lived considerably before the recognition of a regularly received record of dates among the Greeks -- that is, before the year 776 BC, the commencement of the calculation by Olympiads. The date given by Herodotus for the age of Homer -- 400 years before his own time, that is, about 850 BC -- is probable enough; but considering the entire want of any reliable foundation for chronology in those early times, we must not seek an accuracy in this matter beyond that which was attained by the Greeks themselves, and allow a free margin of at least 200 years from the time of Solomon (1000 BC) downwards. To throw him further back than the earliest of these dates would be inconsistent at once with the historical elements in the midst of which his poems move; for his epics exhibit characteristics not in keeping with languages at the earliest stages of their literary development. 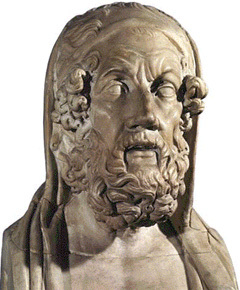 The Ionic dialect used by Homer is, in fact, a highly cultivated shoot of the old Hellenic stock, and which was in the poet's hands so perfect for the highest poetical purposes as to have remained the model for the epic style during the whole period of the literature of the Greeks. In endeavoring to form a correct estimate of the position of Homer as a poet, the primary fact from which we must start is, that he was not the epic poet of a literary age -- like Virgil among the Romans, Torquato Tasso among the Italians, or John Milton among the English -- but he was decidedly and characteristically an aoidos, or minstrel, a character well known to us from our own medieval literature. That there is an essential and vital generic distinction between the popular minstrel of an age when books were either not known or little used, and the cultivated poet of an age which rejoices in all sorts of libraries, and possesses a special class of literary readers, admits of no doubt. The conditions of the work to be done being different, the work itself cannot possibly be the same. The great majority of translators of Homer have not recognized this distinction, and strike an entirely false note. In order to understand Homer, we must look on him as the culmination of the minstrel or ballad poetry, in the shape of the minstrel epos; a grand combination of popular ballad materials and ballad tone, elevated to the highest pitch of which it is capable, with the architectural form and structure of the epos. Some early recognition of this true character is thanks to the criticism of Frederick Augustus Wolf, a celebrated German scholar who in 1795 published a prolegomena to a new recension of the text of Homer. Wolf postulates the Iliad as a compilation of popular ballads, originally separate, and of whose separate existence the sharp-eyed critic can easily adduce satisfactory proof. His theory contains an important observation of the fundamental nature of the epics. It is not credible that poems pervaded by such a wonderful unity of tone and plan as the Iliad, manifestly inspired by a genius of the highest order, should be resolvable into the mere patchwork of skilful compilers; but it is an important truth to announce that the materials of Homer's poetry were not invented by himself, but taken up from the living traditions of the people to whom he belonged, and that even in that grand unity to which his genius subjected them, their original popular tone and spirit is preserved in a fashion which characteristically distinguishes them from all epic poetry of the literary ages. The characteristics of Homer's poetry, as the culmination of ballad poetry and the grand model of the minstrel epos, may be expressed in a very few words. In the first place, the materials are essentially national, and if not strictly historical in every detail of decoration, grow, like all ballad poetry, out of the real life of the people, and rest at least upon an honest historical substratum. In this view, the Iliad is as valuable for the earliest history of the Hellenic race, as Herodotus and Thucydides are for the later periods. But it is not for the Greeks alone that Homer possesses an important historical value; he is for all ages an important record of the earliest stages of human society, second only to the books of Moses, and some of the very oldest of the Vedas. The first germs of almost all other arts and sciences afterwards cultivated by the Greeks and Romans are to be found in Homer. In this view, he was to the Greeks themselves an encyclopedia of their national culture; and, as embodying the grand features of their polytheistic faith, he is also constantly quoted by their great writers with all the deference due a Bible.